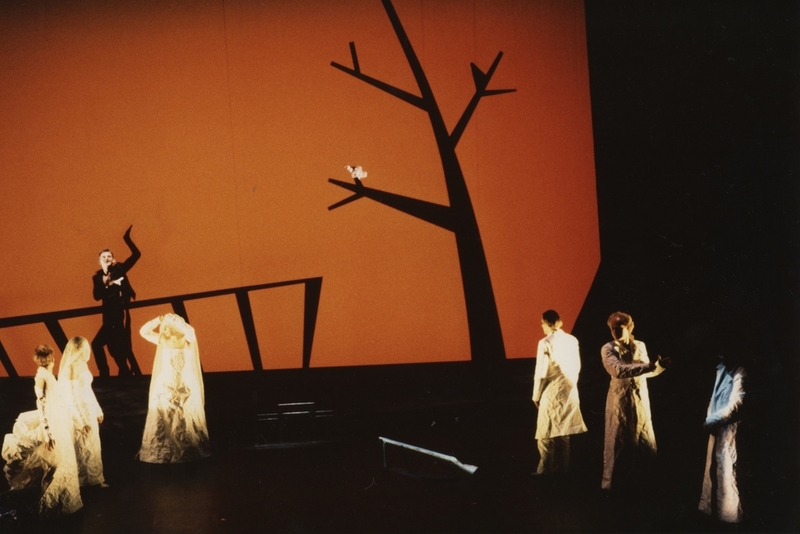 First staged in 1990 at Hamburg’s Thalia Theater, The Black Rider: The Casting of the Magic Bullets was collaboratively conceived by Robert Wilson, American singer-songwriter Tom Waits, and William S. Burroughs, author of Naked Lunch and other texts, many of which have affected a wide range of popular culture and contemporary literature. They based their tale of a hapless young clerk and his fateful pact with the devil on the German folktale and 19th-century ghost story The Freeshooter (Der Freischütz). The original work first starred Dominique Horwitz, Annette Paulmann and Stefan Kurt, and was later revived under Wilson’s direction in 2004, as an English-language version, and starred Marianne Faithfull as Pegleg and Canadian singer Mary Margaret O’Hara as Käthchen. Since 1994, the work has frequently been licensed and mounted by other companies and under different directors. There have been more than 100 licensed production of The Black Rider, mostly in German-speaking and Scandinavian countries, notably at the Schaubühne Berlin, Schauspiel Frankfurt, Dresden State Theater, Royal Dramatic Theater Stockholm, and Det Norske Teatret Oslo. To this day, The Black Rider remains in the repertories of many theaters. Almost 20 years after having created The Black Rider, in 2009, Robert Wilson directed Carl Maria von Weber's 19th-century romantic opera, The Freeshooter (Der Freischütz), which was based on the same ghost story as this work. For presenters and venues in Germany, Austria, Netherlands, Belgium, France, Spain, Italy, Poland, Czech Republic, Armenia, Norway, Denmark, and Sweden, please contact the Felix Bloch Erben Publishers. For all other regions, please contact the Music Sales Corp.
To obtain rental material, please contact G. Schirmer Publishers.